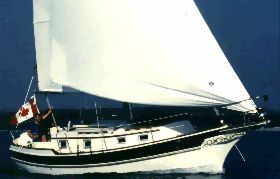 Bill Hardin, probably best known for being a pioneer of the Taiwanese boat building industry for the American market, penned the Hardin 45 “Voyager” in the late 1970s. It’s a heavy displacement bluewater boat particularly well set up for cruising in comfort and style. 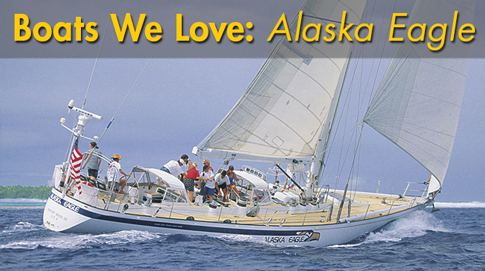 The boats were built between 1977 and 1982 in Kaohsiung Taiwan by Hardin International and sold through their U.S. distributor, East-West Yachts in Marina Del Rey, California. Originally built and sold as the Bounty 44, the boat got an update in 1980 when Hardin made some significant changes. These included extending the boat length to 45′ 2″ and a six inch reduction in draft from to five and a half. Along the way the transom was trimmed down and a couple of portlights in the hull were relocated to the aft cabin top. To reduce confusion to customers who often wouldn’t notice the difference, dealers would refer to both boats as the Hardin 45. The boats were generally of quality construction with excellent structural integrity and good joiner work. A total of around 130 Hardin 45s were built by the time the factory closed in the mid 1980s. These center-cockpit designs had most of their attention in their beautiful and spacious interiors finished in hand crafted teak. The centrepiece of the accommodations is a split level salon giving an open and airy feel due to the copious amounts of light coming in from the raised salon glass, portlights and butterfly hatch. On the lower of the split levels were two seagoing berths. In the mid-cabin forward of this area are two pilot berths, many use this area as a “storage garage” while on some boats of this area was modified to make room for a larger master head with tub/shower combination. There’s also large aft stateroom with an additional head. A few boats were built for chartering which crammed more berths into the layout. They had a v-berth as well as a double cabin stateroom forward of the salon. 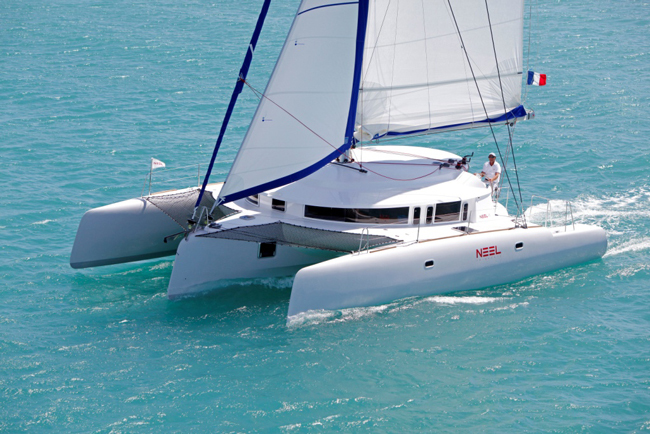 It seems most of the thought behind the design of Hardin 45 was to optimize the experience under anchor. With so much glass above deck (bringing in that all important “light and airy” feel), it’s nearly essential for those planning bluewater passages to have a set of storm shutters for all of that glass. Fiberglass storm shutters were offered by the factory back in the day, but not many took the offer. 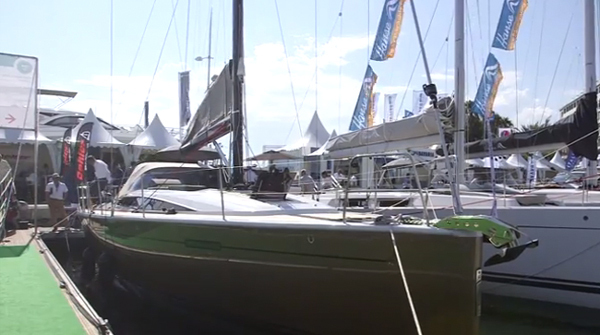 At 32,000 pounds The Hardin 45 is well and truly in the heavy boat category with weak light air performance. 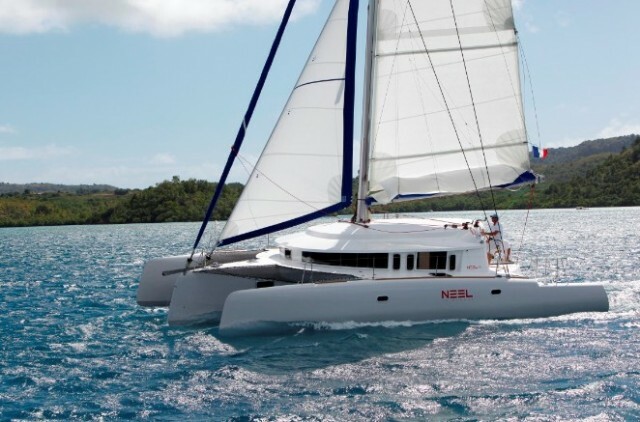 Yet on the other end of the spectrum, with only 25% of their weight in the ballast with shoal draft keel, they don’t go very far in blow. They are however very comfortable. At least one Hardin owned by Gordon and Joan Mery has been credited with a nine year circumnavigation, they commented after 38,000 miles under their keel, “it isn’t that fast for a boat, but she’s pretty quick for a house”. 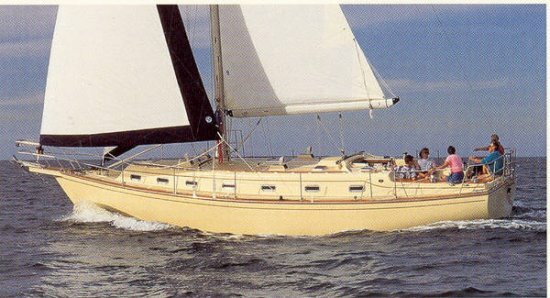 Another owner having singlehanded 10,000 miles in his Hardin confirms she is “solid slow and comfortable” and tells of an episode where he was caught in a 75 mph blow with twenty foot breaking seas saying, “I didn’t go anywhere, but it was comfy”.